Rev. Cornelius J. Bresnahan, CSV, died on Thursday, April 17, 1986 at St. Joseph Home in Palatine, IL. Fr. Bresnahan died at the age of 70 in the 45th year of his religious profession and the 41st year of his priesthood. Fr. Bresnahan entered the novitiate in January of 1941 and pronounced his first vows on March 22, 1942. From 1942 to 1945, he studied at the Viatorian Seminary at Catholic University in Washington, D.C. During this time he also earned a M.A. in Social Welfare Work and Psychology. On May 20, 1945, Fr. Bresnahan was ordained to the priesthood by Archbishop Bernard J. Sheil. 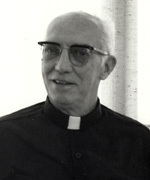 Beginning in 1945, Fr. Bresnahan embarked on a long career as an educator and pastoral minister. 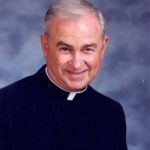 He taught at St. Joseph’s School for the Deaf in New York, Cathedral Boys’ High School in Springfield, DePaul University, St. Ambrose College and Marycrest College in Davenport and finally, from 1961 to 1969 at St. Viator High School in Arlington Heights. In 1969, Fr. Bres began ten years of service in parochial ministry serving as an associate pastor at St. Viator Parish and Our Lady of Las Vegas Parish, both in Las Vegas, NV. From 1974 to 1978, he served as an associate pastor at St. Joseph Parish in Springfield, IL. From 1978 until the time of his death, he served as chaplain for the St. Joseph Retirement Home in Palatine, IL. Visitation was held at the St. Joseph Home, Palatine, IL at 3:00 p.m. on Friday, April 18, 1986. A wake service was held at 7:30 p.m. on Friday evening. The funeral Mass was celebrated at St. Joseph Home at 10:30 a.m. on Sat., April 19, 1986. Burial was at Queen of Heaven Cemetery in Hillside, IL. Father Bresnahan is survived by a sister, Mary Catherine Brown, and nieces and nephews in the Chicagoland area. Please remember Father Bresnahan in prayer and celebrate a Eucharistic liturgy for the repose of his soul.